With so many treadmills to choose from, trying to narrow the selection down to only one is not easy. This is especially true if you plan on putting in some serious miles every week. You want one that can handle varied workouts while offering thoughtful features that will keep your workouts fresh and exciting. For this reason, we recommend the Sole Fitness F63 Folding Treadmill. It gives you solid performance without too many extra frills that you might not feel you need. 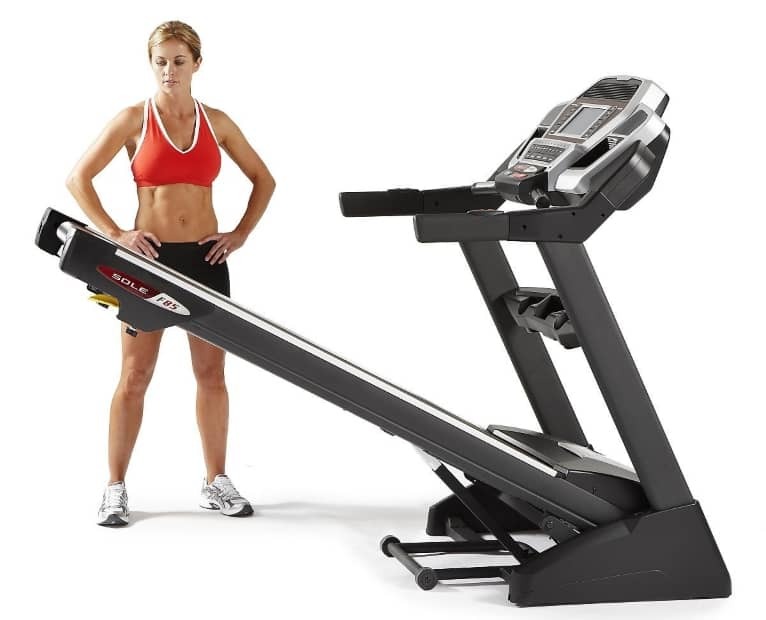 How Does the Sole Fitness F63 Folding Treadmill Work? The first thing you notice about the product is how streamlined the control console is. It is fairly simple, so those who typically feel overwhelmed by high-tech layouts will appreciate this one. The alphanumeric text center keeps you updated with progress throughout your workout. Although you can use the speed and incline controls, you may also want to choose one of the six preset programs. You can go ahead and plug-in your iPod or MP3 player, too, and take advantage of the built-in speakers. The Sole Fitness F63 is powered by a 3.0 continuous duty HP motor. It is capable of reaching speeds up to 12 mph. It can also incline up to 15 percent with the push of a button. We love that its precision-welded frame keeps the unit from bouncing around at faster speeds. This is also credited to the zinc-coated balanced flywheels that create a vibration-free surface. One of the things we love most about this product is the treadbelt. First, the fact that the running surface is 20″ x 60″ is more than generous to even tall users. Also, the belt is made with four layers. There is a middle PVC layer that has a nylon backing. On either side is a rubber layer. This ensures smooth operation, and it creates a static-free surface. So, you won’t get zapped by the first thing you touch when you get off the belt after your run. When not in use, the Safety Lock Deck folds into an upright position and locks into place. When you are ready to use it again release the deck and step away. It will slowly unfold to the ground on its own. What Are the Health Benefits of Using the Sole Fitness F63? Adding the Sole Fitness F63 Folding Treadmill to your home is a huge step in reaching your long-term health goals. Running strengthens and tones your body. It promotes blood circulation, improves cardiovascular health, and helps reduce your risk for many health concerns. If your goal is to lose weight, the pounds will come off naturally. You will turn fat into lean muscle, and muscle naturally burns more calories, even at rest. Since this unit can incline up to 15 percent you can reduce the strain put on your back and joints. Also, the Integrated Message Board allows you to keep track of distance, calories burned, and more, so you can set personal goals to reach during your workouts and track your progress. Built-in fans keep you cool during a workout. Weight capacity of 325 pounds. Generous 20″ x 60″ running surface. Four-layer belt delivers smooth and static-free operation. Flywheels ensure a vibration-free and secure surface. Lifetime warranty on motor and frame. Three-year warranty on deck and all other components. Labor is covered for one year. You can look for this product at online retailers and in sporting goods stores, but we recommend Amazon for the best deal and the safest transaction. Amazon is a secure site; purchases ship quickly and customer service is fantastic. You can purchase from Amazon for only $999.99. This is $700 off retail price, and Amazon has free shipping right to your door. This is a solid constructed treadmill that delivers smooth operation. It can handle fast speeds and interval training, and it has a long running surface that welcomes nearly any stride. It doesn’t have some of the more technical features as a couple of our favorite picks, but if performance is your main priority, you really cannot go wrong with this one. Reviews are always helpful in making a huge buying decision. However, not all reviews on the internet can be trusted to be written by actual customers. This is why we recommend reading reviews at Amazon where there are always honest opinions.